the Arab nations of Egypt, Syria, Iraq, and Jordan were preparing to change the map of the Middle East, once and for all. With very loud and public proclamations, President Abdel Nasser of Egypt declared they would rid the world of the “Zionist Entity,” Israel, and unite the Arab world as never before. There was only one small roadblock at the time that would hinder the massive united Arab army from carrying out their genocidal plans—a small armed force from the U.N. placed as “peace keepers” in the Sinai and a buffer zone between Israel and Egypt. To the world’s amazement, that small force was removed by a simple request from Nasser. No one was alarmed enough to protest at the U.N. Assembly…including the United States! Now the Arab leaders knew they had been given carte blanche to do as they wished with the tiny Jewish State. By the time the ceasefire was announced in the War for Independence in 1949, Israel would be only nine miles wide from the western border with Jordan to the Mediterranean Sea! Once again… it was painfully obvious that Israel would stand or fall all by herself. I am embarrassed to note that during some of Israel’s most desperate hours, the United States of America was nowhere to be found. Even during the devastating Yom Kippur War of 1973, it took the threat of a nuclear launch by Prime Minister Golda Meir to get President Richard Nixon off the fence and re-supply Israel’s desperately depleted weapons arsenal. How is it that with the Holocaust only twenty-two years in the global rear-view mirror that such complacency could once again settle into the world’s conscience? The reason is simple…a King is coming. 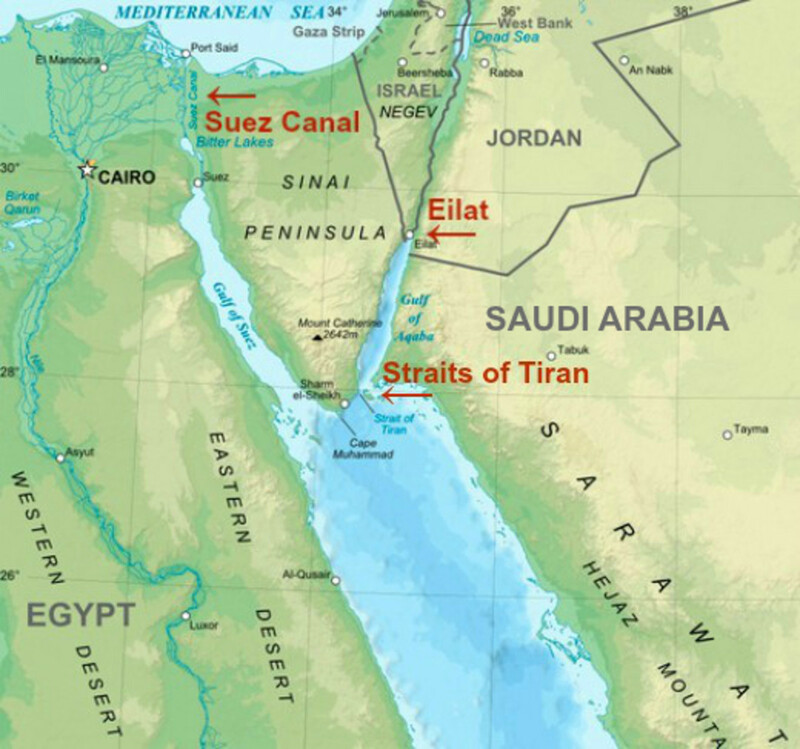 the leadership of Israel wrestled with the dilemma of her neighbors amassing huge armies on the border with Israel as well as blockading the shipping lanes in the Straights of Tiran—Israel’s only link to the critical oil and gas supplies needed to fuel tanks, planes, and infrastructure. Then one night a desperate and highly risky plan was formed to launch a pre-emptive strike against the far superior force in an attempt to thwart the first strike advantage the Arab armies could have. Was this the most foolish… or the most brilliant war strategy of all time? Was this the most foolish or the most brilliant war strategy of all time? Only time would tell. So, at 7:15 A.M. on June 5th, 1967, the bulk of Israel’s Air Force took off in groups of four planes to attack the airfields and warplanes of Egypt. They flew low and fast, only 800 feet above the desert in order to avoid early detection by the Egyptian radar. Nasser had just signed a pact with Jordan giving them direct control over the united armies, and so at the time of the attack, the overly confident Egyptian pilots were quietly having breakfast and discussing their future plans. In wave after wave, the Israeli pilots dropped their bombs disabling the runways and destroying the entire Egyptian National Air Force. The Israelis returned time and again to refuel and rearm, and because they had prepared well, the turnaround time was a slim twelve minutes! Not one plane or pilot was lost, and in four hours the battle for the air was over! The world stood by in stunned amazement as the tiny nation of Israel took only six days to capture and hold the entire Sinai and Gaza Strip from Egypt, the Golan Heights from Syria, and the West Bank and East Jerusalem (the Old City) from Jordan. but Gordon Robertson and CBN have created an incredible presentation for us all this year. “In Our Hands, the Battle for Jerusalem” is a beautifully executed documentary film that will be premiered for only one night in select theaters across America. Tuesday, May 23rd is the night, and I highly recommend you make plans to view this film. Yes, I have seen it, and that is exactly why I am recommending this powerful presentation to you, your family, your church or synagogue, Bible study or prayer group. There are many reasons to celebrate God’s faithfulness to us all, but this year and next give us even more times to cheer.